Arf! Hi, I’m Marley. I turned five years old today. That means I can apply to be one of Santa’s sled-pullers this year; but first I gotta get in better shape; can you help me? 2. Us Malamutes are known for our great stamina and strength...it’s just that I kinda ate WAAAY too much food this Thanksgiving; so I got a little extra pudge to work off. 3. To help me out, just sit in this sled and lemme pull you around. Hang on tight, I can go SUPER fast! See, look at my bulging muscles; my high-protein diet’s must be working! 4. *CRASH! * Arf-arf, OH NO Farmer! I was so busy admiring myself I lost control of the sled. I must’ve been going INSANELY fast to have flung you out into the community crops! 5. Hmm, well I guess, I still have stuff I need to work on. Hey farmer, can you teach me how to be a better, more humble student? In return, I’ll help you with AALLL your Farming! 6. I’ll even help you make all your Christmas gifts AND if Santa chooses me as one of his sled pullers; I’ll make sure you get a front row seat in his sleigh this Christmas eve! 7. Woof-Woof! I just checked in with Mama and Papa and they think we have a great plan worked out. They even said they’ll stay here and help us. Yay yay! What’s next? 8. Aha, Papa says downhill skiing’s great exercse and it’s fun too. C’mon let’s give it a try farmer. At this rate it’s definitely gonna be Me, You and Santa this Christmas eve! same for me. i used to be able to finish all missions, but for a while now i can finish none. i am about to quit as well. Yes I agree the last few mission have been really expensive. I can´t acces to any page for play FB, anyone else have the same problem? Thank you everyone for the heads up on RC prices. 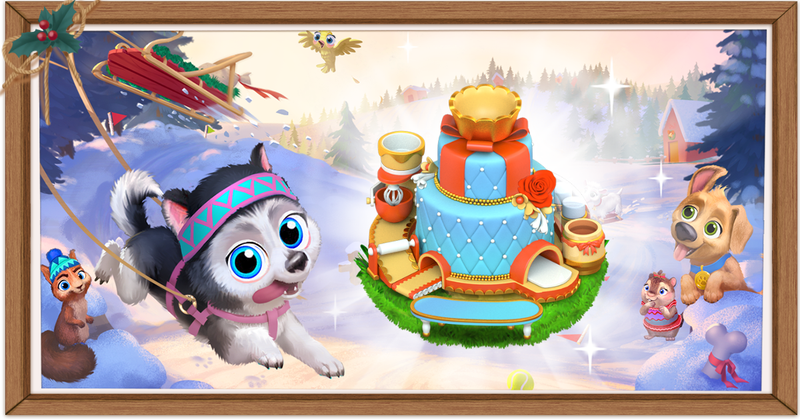 The Alaskan Malamute sure looks cute, and I am sure the Fondant Cake Machine could come in handy, but this mission is way too expensive for me! To make the socks you also need a macaroni penguin (9RC) and for the plate set you need to unlock the brush (5RC). Als this together makes it an expensive mission. Misread PI post. Thought she was asking a question, and after I posted, saw she was replying to lynda! Oops! PI, yes, it is the fondant cake machine. The malamut habitat will cost 8 rc (on sale parts) and the rest are free gifts.